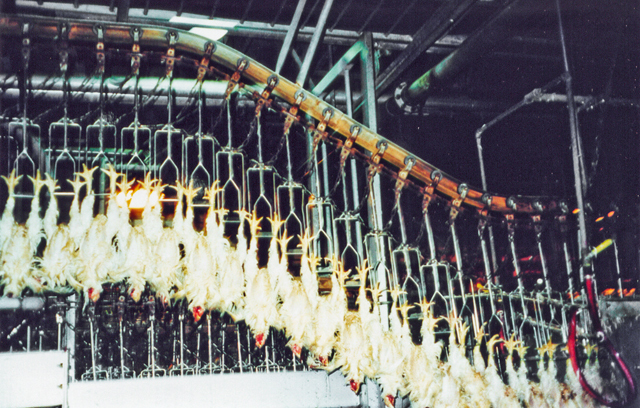 At the slaughterhouse, chickens are hung up by their feet fully conscious. Although some slaughterhouses stun the birds by passing them through an electrified bath of water, US federal law specifically excludes chickens from the Humane Slaughter Act mandating that animals be stunned before being killed. However, often times the birds are not rendered unconscious by the shock and proceed, still hung by their feet, to have their necks cut by a mechanical blade. Unfortunately if the bird is not sufficiently stunned, the blade may not actually kill it and the animal proceeds to the next stage in the process while still alive. The birds are then submerged in boiling water to scald them and remove feathers. It's estimated that millions of chickens a year in the US are ultimately killed in the slaughterhouse by this last step, being boiled alive.